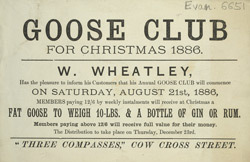 Organisations such as Wheatley’s Goose Club were set up to help the poorer members of society to pay for food and drink. The tradition of eating goose on Christmas Day stretches back to the middle ages, when, along with the swan, it was the the customary festive dinner for the rich. Elizabeth I even ordered everyone to eat goose as a tribute to the sailors who had fought off the Spanish Armada - goose being the first dish she had eaten after she heard of the victory. By the 1800s goose was a relatively inexpensive choice; turkey was then considered a delicacy.